Five hands-on, student-driven investigations are at the heart of the PLT GreenSchools program. Using critical-thinking and problem-solving skills, students will analyze their school’s energy, water, school site, waste and recycling, and environmental quality. Register or log in to access each investigation individually, or purchase a print copy of the complete set. The results of the PLT GreenSchools Investigations will help students identify areas where improvements can be made to make their school greener and healthier, and in many cases save money. 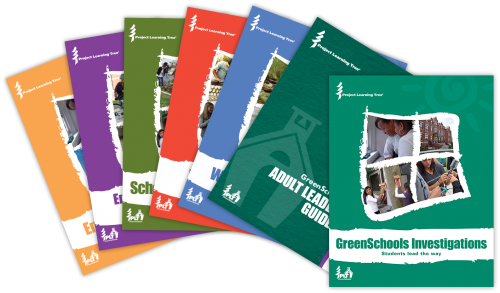 Learn about the benefits of becoming a GreenSchool, how to form a Green Team, get equipment, and conduct investigations. Investigate how much energy your school uses, the sources of that energy, and ways to save energy. Investigate ways to improve indoor air quality, transportation, safe chemical use, and more. Investigate habitats, wildlife, trees, gardens, and ways to improve, maintain, and use the grounds for learning. Investigate how much waste your school generates, where it goes, recycling and composting. Investigate the source, cost, and quality of your school’s water supply, and ways to conserve water. To download the Adult Leader Guide and the Investigations, register or log in. Or purchase a print copy of the complete set.